Is it a wallet? Is it a wristlet? Is it a purse? It’s all of those! 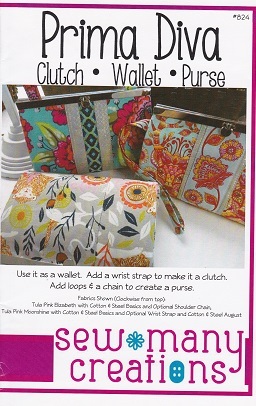 This versatile organizer wallet can be made with an optional wrist strap or chain loops. Inside you’ll find lots of card pockets-12 card pockets, 3 open pockets, 2 zippered pockets and plenty of room for your cash and phone too! The Prima Diva uses the 7-1/2″ Frame.